The Quezon City International Pink Film Festival (QCIPFF) closes the city’s Diamond Jubilee Year Celebration with a landmark event that will provide greater recognition for the country’s lesbian, gay, bisexual, transgender, and queer (LGBTQ) community. The QCIPFF will be held on October 6-11, 2015 at the Gateway Cinema 1, Araneta Center, Cubao, Quezon City. This year’s edition features prizewinning films from the Berlin Film Festival where Pink Festival Director Nick Deocampo was part of the 2015 film jury in the TEDDY Awards, a section dedicated for the showing of LGBT films. Bringing the Berlin prizewinners to local audiences, Deocampo has programmed the TEDDY Best Film Nasty Baby (USA) to be the closing film on Oct 11. Other Berlin prizewinners include El Hombre Nuevo/The New Man (Uruguay/Chile/Nicaragua), which won the Best TEDDY Documentary. Opening the festival is the hottest film in the LGBT film circuit, Dressed as a Girl (UK), with the film’s producer, Chris Amos, present at the festival to introduce the film. It will be shown twice on Oct 6 and 9. Included in the program are other Berlin entries like Kumu Hina (USA) and the Jury Prize winner, Stories of Our Lives (Kenya/South Africa). Last year’s edition featured Cannes prizewinners like the controversial Palme d’Or winner, the lesbian film Blue is the Warmest Color (France). Local films include Esprit de Corps, Esoterika Maynila, I Love You, Thank You, Pinoy Transking, selected short films like Julie from Cebu, and the Fil-Am film, Shunned. 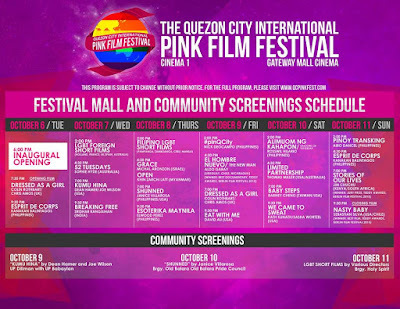 With the resounding success of last year’s festival, the holding of QCIPFF2 will be made meaningful this year with the passage of the historic “Gender Fair Ordinance.” It is a cause for great celebration as this historic social emancipation bill—the first in Asia—signifies Quezon City’s progressive outlook towards the future under the administration of Mayor Herbert Bautista. The pioneering law makes Quezon City the first government agency in the Asian region to create a government-supported LGBT Council. With such a progressive agenda to promote, the festival serves as a fitting platform that will seek to galvanize Quezon City’s stature not only in the Philippines but in Asia as the leading model city for gender emancipation. 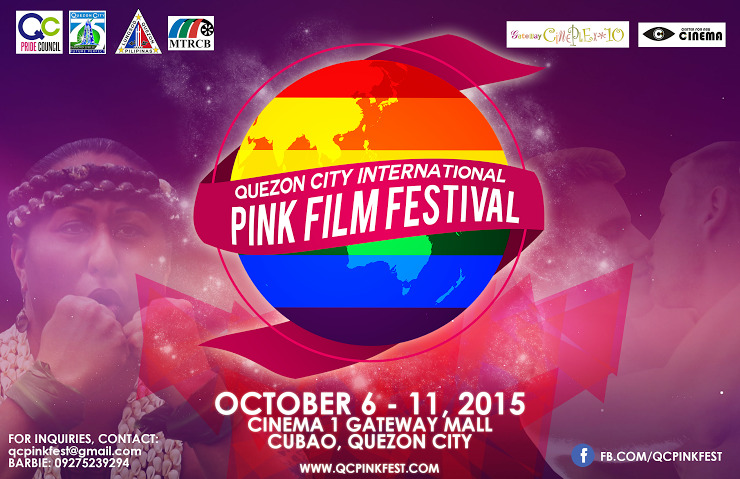 The QCIPFF is organized by the Quezon City Pride Council for the Quezon City Government and the Diamond Jubilee Committee.